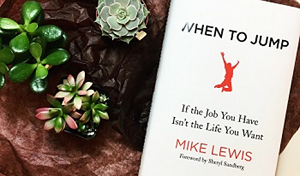 This subject is the centerpiece of author Mike Lewis' upcoming book, When to Jump. It's a subject that Mike will also bring to Penn Foster, when he hosts the Make Your Jump webinar on Tuesday, January 16th at 1:00PM EST, which will feature the stories of three individuals who are using their Penn Foster education to support their jump towards their passion. Photo Credit: When to Jump.